Taking a quick break for a picture at the Project Play 60 event at Lambeau Field. Through the past year, the UW-Oshkosh American Red Cross Club has continued to be actively involved in the community and fulfill the mission of the American Red Cross. To start the semester off, a few of our UWO Red Cross Club members participated in the Polar Plunge to help raise money for the Special Olympics. 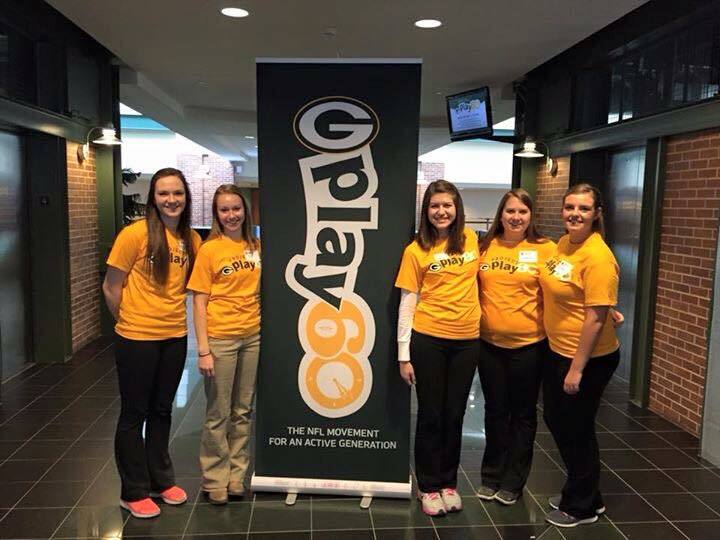 In March, we carpooled to Lambeau Field in Green Bay, Wisconsin and Volunteered at Project Play 60, the NFL movement for an active and healthy generation. Some of us passed out healthy snacks while others helped with face painting. No matter what we did, it was great to see all the children staying active and having a great time. Later that month, we visited King Veterans Home where we played bingo and interacted with the veterans. Over the past year and a half, the UW Oshkosh American Red Cross Club has visited King Veterans Home in King, WI three times. On one of our visits, our club had the opportunity to assist with bowling at a bowling alley, which was located in the facility. That was a very memorable experience seeing the veterans destroy all of the volunteers on the scoreboard! Many of the veterans had a competitive spirit and we had an absolute blast alongside such wonderful people who have dedicated themselves to our country. On our recent trip on Sunday, March 8th, our volunteers had the most powerful experience. We assisted the veterans to their seats and prepared them for an intense game of Bingo. As volunteers, we assisted with distributing prizes, visiting with the veterans, and talking with them. As soon as the veterans entered the room for Bingo, their faces lit up with smiles. A UWO American Red Cross Club member, Courtney Gussert stated: “It was a great time at King Veterans Home as many of the veterans along with the volunteers instantly had a smile on their faces when they entered the bingo room and saw us…” Ali Sommerfeldt had a similar reaction to her experience at King, “There were so many times when I could catch a resident’s eye while we were playing bingo and they would just beam over at me. It is the best feeling knowing that you can make a difference in someone’s day just by spending a few hours with them.” Volunteering at King was an exceptionally rewarding experience. Our club looks forward to volunteering with these amazing men and women veterans in the future. 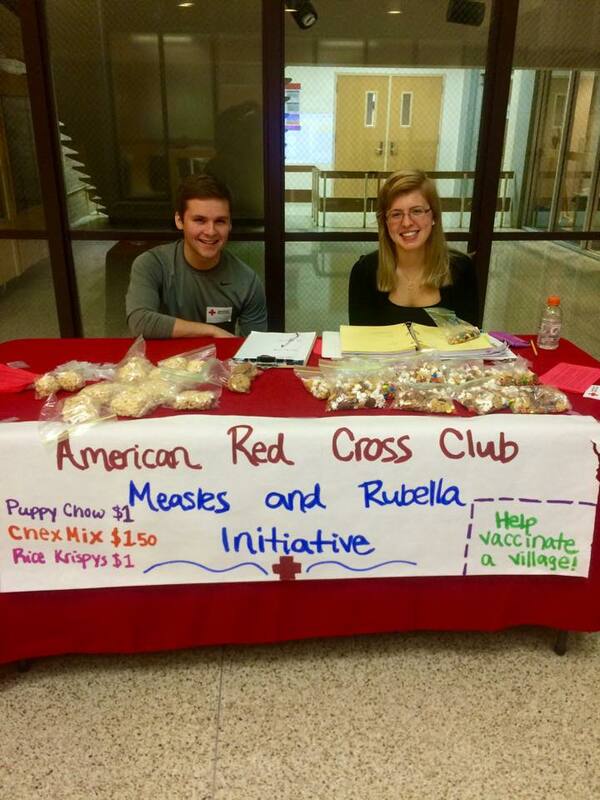 UWO Red Cross members sold yummy snacks to raise funds for the Measles and Rubella Initiative. Since March is Red Cross Month, we hosted a Measles and Rubella Initiative in our campus library. We sold homemade snacks that came with a ribbon pin for $1.00 and we raised just under $100. In April, we hosted and participated in, “Give What Fire Takes” and placed donation boxes throughout campus dorms. We collected new blankets, books, and toys for children who have been impacted by a fire. Later that month, a few students volunteered at a local fire station to collect and disassemble old car seats so that children have safe and up to date car seats. In three hours, they recycled a few hundred car seats! In May, a few of our members volunteered at Kidsfest at Menominee Park in Oshkosh to celebrate the opening of the park, which features a zoo. Kaitlyn Schmitt volunteered at March for Babies in Oshkosh where she helped set up and face paint for the little kids at the walk. Our final event of the semester was an American Red Cross Blood Drive set up by our Blood Services Chair, Brenna Schobert. We were able to successfully collect fifteen units of blood. 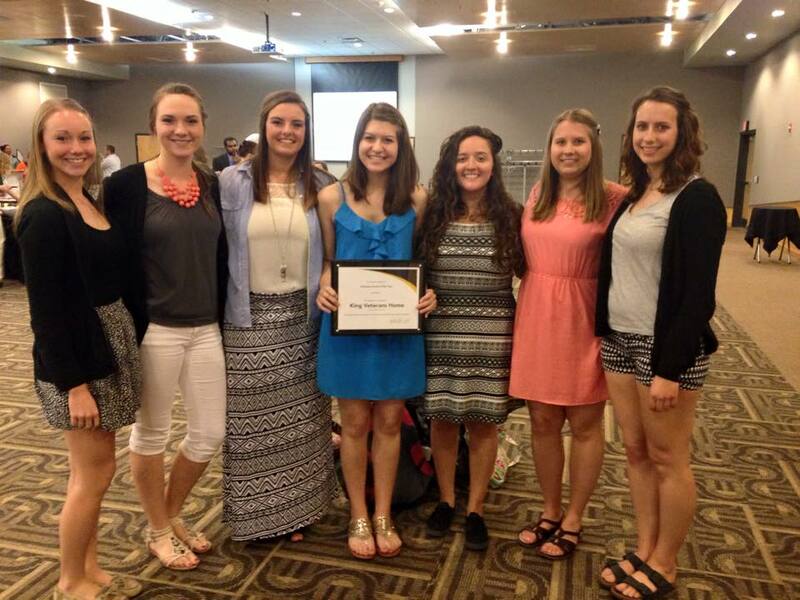 On May 5th, 2015, a few of our members attended the Student Leadership and Involvement Awards. We were nominated for Volunteer Organization of the Year and Volunteer Event of the Year. We also nominated Crystal Wrensch for Outstanding Emerging Leader and Ali Sommerfeldt, Courtney Gussert, and Brooke Trzebiatowski for Emerging Volunteer of the Year. Kaitlyn Schmitt, the outgoing Service to Armed Forces Chair who has now stepped up to fulfill the role as president of our club, nominated King Veterans Home for Volunteer Event of the Year for the University of Wisconsin – Oshkosh Student Leadership and Involvement Awards. We are pleased to announce that our nomination won! The campus was very impressed with our dedication to serving our American heroes at King and our memorable experiences doing so. Outstanding Emerging Leader Award winner Crystal Wrensch (L) and Brenna Schobert (R) spread the word about the American Red Cross. The UW-Oshkosh American Red Cross Club was happy to announce that its very own member, Crystal Wrensch, was the winner of the of the Outstanding Emerging Leader award at the Student Leadership and Involvement awards this year! Crystal is not only part the American Red Cross Club, but is also an active member of the Oshkosh Student Nursing Association and is a Student Alumni Ambassador. She is able to balance being a part of many clubs while carrying 17 credits and keeping a 3.0 GPA. She recently traveled to Costa Rica to volunteer at an orphanage, which has helped her develop into the outstanding leader that she has become. As part of her role as the Fundraising Chair on the executive board of the American Red Cross Club, Crystal was responsible for the entire organization of two large-scale events and executed them perfectly. The first event Crystal organized was the Service to the Armed Forces Awareness Concert which took place this past November on the day after Veteran’s Day. Crystal formulated the idea, organized the location and decorations, as well as secured promotions and prizes, and of course hired our performer for the event, Rob Anthony. She called upon fellow club members to assist her with promoting the event and encouraged the collaboration of marketing ideas. Amazingly, Crystal was able to put together a spectacular event in only a month and she executed the task flawlessly. Another event Crystal was in charge of this past March was a week-long fundraising initiative to raise money for Measles and Rubella vaccinations for children in developing countries through the American Red Cross. Crystal took charge of informing the volunteers about the initiative and got them excited about it as well as other students around campus. Under Crystal’s leadership, our club was able to raise enough money to provide vaccinations for almost 100 children! Her leadership skills brought on a global impact while staying right on the UW Oshkosh campus. Crystal is a responsible, passionate, and goal-oriented individual who strives her best in all aspects of her life. 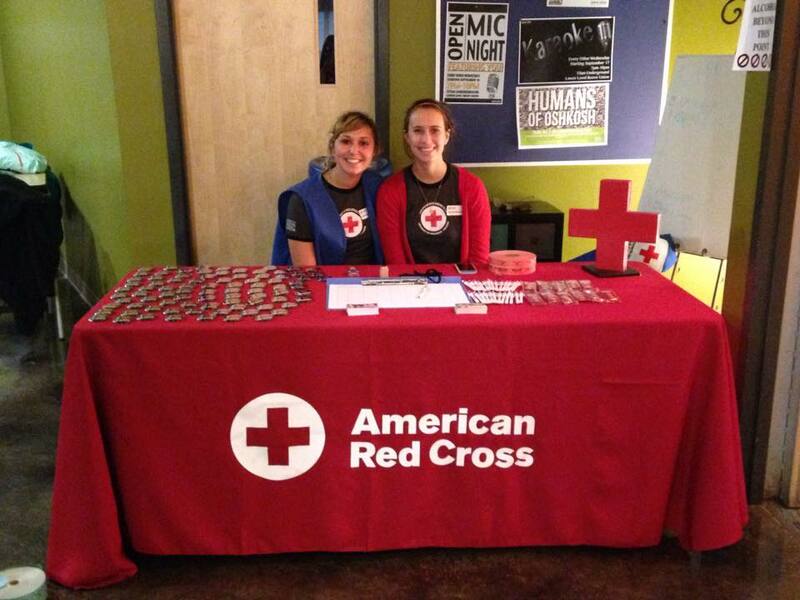 She takes pride in her work and the UWO American Red Cross Club is proud to have her as an executive member. Her “just go for it” attitude has helped her excel in every aspect of her life and other club members look up to her as a leader. We are thankful for her leadership and dedication and we are eager to see what the future holds for her. We are very proud of all of our club members and the amazing things that we have accomplished this semester. With a strong executive board next year and a list of ideas to make a positive impact on the lives of others, we are looking forward to what incredible achievements we can accomplish next year! Congrats to UWO Club Red members on their winning nomination for King Veterans Home for Volunteer Event of the Year for the University of Wisconsin! 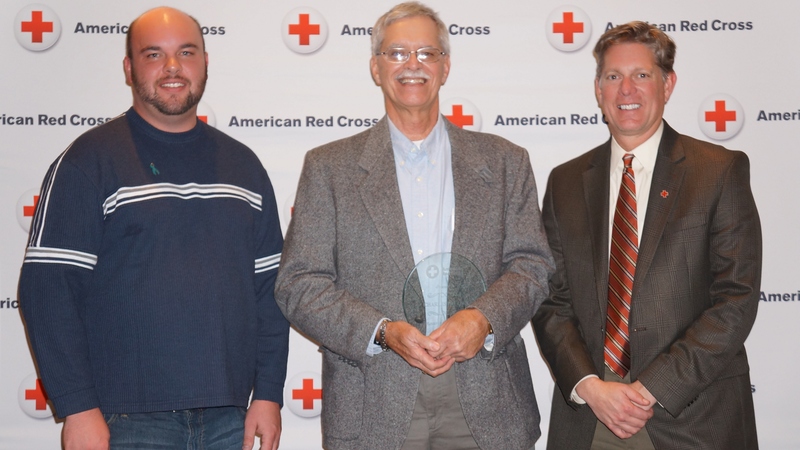 The local American Red Cross honored volunteers and community partners at the Celebration of Support event Thursday, November 6, 2014. Around 100 Red Cross volunteers and community supporters attended the event hosted by The Waters and sponsored by Festival Foods. Joining Steve Hansen, Chapter Executive was community members from several cities. The Northeast Wisconsin Chapter covers 20 counties and the diversity of skills; experience and proximity are recognized in the awards below. (l-r) Nick Cluppert, Disaster Program Manager, Tom Powell, Mental Health Disaster Volunteer, Steve Hansen, Chapter Executive. Thomas Powell, of Ripon, Victor Fousek Emergency Services Award for outstanding commitment assisting local and national communities impacted by disasters. Norman “Gene” Wallis, of Appleton, Outreach Award presented to a volunteer for exceptional support in Health and Safety, Services to Armed Forces, or other areas that involve education and outreach promoting Red Cross services. Nancy Hammock, of Fond du Lac, Blood Services Volunteer Award for exceptional reliability and dedication to the blood services program. Janet Meyer, of Hortonville, Behind-the-Scenes Award presented to a volunteer who assists with essential office work at our (Appleton) office locations in development, facilities, reception and other behind-the-scenes jobs. Angie Dusenberry, of Oshkosh, Rookie of the Year, presented to a volunteer for exceptional level of service who has started within the past year. Traded Treasures, in Ripon, and ADOVCAP, in Oshkosh, Corporate Benefactor Award, for a business with outstanding commitment to their communities and collaboration with the American Red Cross. (L-R) Pat Exarhos, Board Member and Steve Hansen, Chapter Executive. Pat Exarhos, of Appleton, Leadership Award, presented to a member of the volunteer board of directors, committee or program for exceptional leadership, contribution and support for the advancement of the American Red Cross. 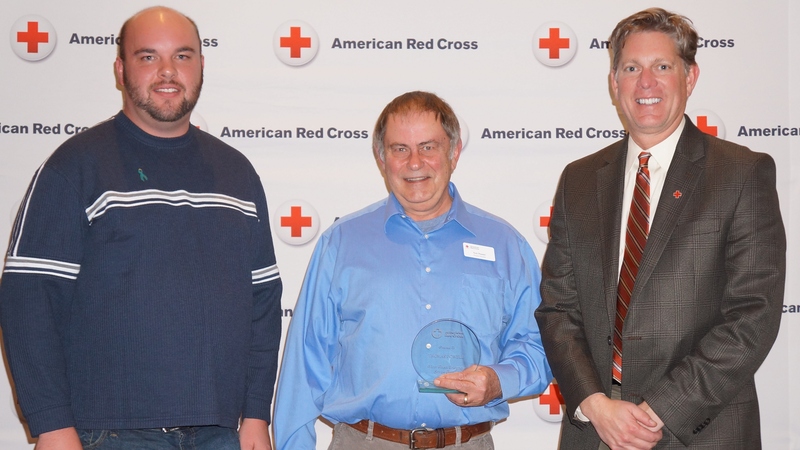 Charles Patzer, of Wild Rose, Volunteer of the Year Award, presented to the individual who has demonstrated excellence and long-term commitment to the American Red Cross. This individual gives time, talent and knowledge in ways that improve the quality of the programs and services of the organization. 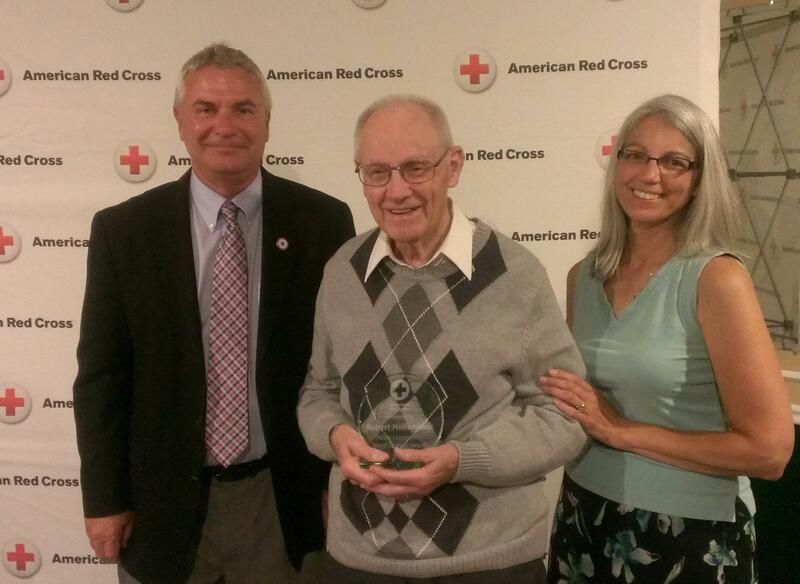 Howard Porter, of Appleton, Clara Barton Award, presented to an individual who exemplifies the qualities of American Red Cross pioneer Clara Barton. (l-r) NIck Cluppert, Disaster Program Manager, Charles Patzer, Disaster & Services to Armed Forces Volunteer, Steve Hansen, Chapter Executive. All award recipient photos are posted on our local Facebook page and Flickr site. The American Red Cross of Northeast Wisconsin Chapter celebrated its partners at the annual Celebration of Support Event on Tuesday, June 24 at the Riverside Ballroom in Green Bay. Two hundred and sixty attended the event, comprised of Red Cross volunteers, community partners and The Grainger Foundation representatives; the event sponsor. The crowd was brought to their feet upon hearing the amazing acts of volunteerism and collaboration. WBAY-TV anchor, Kathryn Bracho served as the Mistress of Ceremonies. The program kicked-off with incoming Board Vice-chair, Chris Vanderheyden of Double Digit Sales Growth, welcoming words and appreciation for all who give of their time, talent and treasure to help the Red Cross fulfill its mission. Following Vanderheyden was Greg Novinska, CEO, Badger-Hawkeye Blood Services Region with an update on our collection, testing and distribution of life-saving blood products. The first awards were presented to One-a-Week Club businesses and clubs who committed to at least 52 donations of blood per year, or one per week during the previous year. After dinner, the Volunteer Recognition Awards were presented to individuals and groups for their exceptional volunteer work. Jean Frisch, of Wisconsin Public Service, Ed McHugh Worker of the Year award for front-line volunteers with exceptional reliability to the blood program. 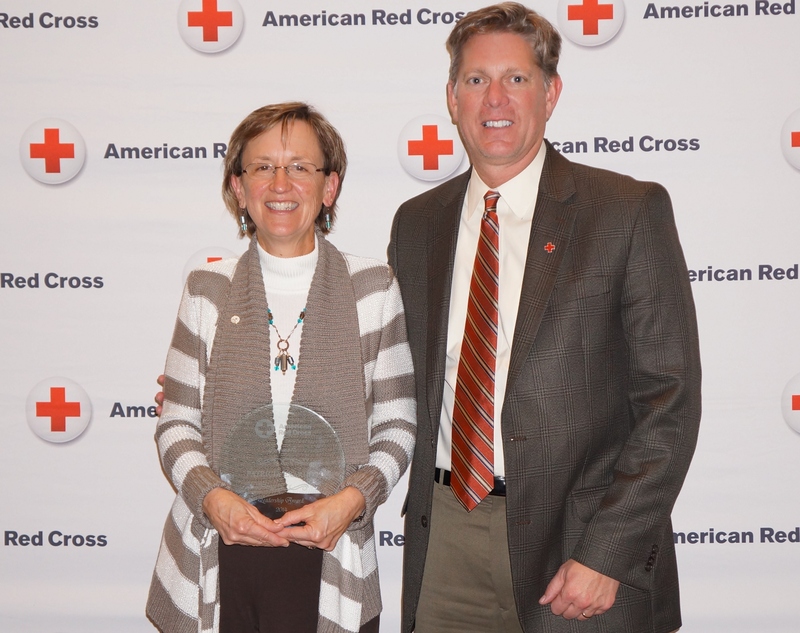 Associated Bank, Business, Group or Organization of the Year, given to a business or group of volunteers for years of commitment to the American Red Cross Blood Services program. Robert Hollenback, of Sheboygan Falls, Hilary Lesperance Award for outstanding support in the Blood Services Program. Territory Three Disaster Action Team, Kerrie Forester Emergency Services Award for commitment and dedication to Disaster Services. John Mueller, of DePere, Andrew Janssen Transportation Award, for outstanding work in transportation services for the American Red Cross and providing transportation for the elderly population and those with disabilities to help them sustain an independent lifestyle. Rick Jerry, of Green Bay, Outreach Award, for outstanding service in Preparedness, Health and Safety, education and outreach. Sharon Davister, of Green Bay& Bonnie Rozmarynowski, of Denmark, Behind-the-Scenes Award presented to a volunteer who assists with essential office work at one of our office locations in development, facilities, reception and other behind-the-scenes jobs. Pakou Lee, of Green Bay, Rookie of the Year, presented to a volunteer for exceptional level of service and has started within the past year. Schneider, Corporate Benefactor Award, for a business with outstanding commitment and dedication to the American Red Cross. Aymee Balison, of De Pere, Mrs. Crane (Mary) Murphy Award, presented to a member of the Board of Directors for exceptional contribution and advancement of the American Red Cross. John and Lynne Wilson, of Iron Mountain, MI, Volunteer of the Year Award, presented to the individual who has demonstrated long-term commitment to multiple programs of the American Red Cross. (l-r) Shawn Kiser, Major Gifts Officer, Jody Weyers, Director of Volunteers, Jim Rivett, Clara Barton Award Winner, and Mary Gronnert, Foundation Manager, Schneider, Corporate Benefactor Award. James Rivett, of Green Bay, President of Arketype, Clara Barton Award, the highest award of the night, presented to an individual who exemplifies the qualities of American Red Cross pioneer Clara Barton. Congratulations to all the award recipients and thank you to everyone for your time, blood and support of the American Red Cross. Click HERE to see pictures of all the award recipients. The American Red Cross Northeast Wisconsin Chapter celebrated its volunteers June 12, 2012 with the Volunteer Recognition Banquet held at the Riverside Ballroom in Green Bay. The event was sponsored by Ameriprise Auto & Home Insurance. Two hundred and thirty-five volunteers attended the event. WBAY-TV anchor Action 2 News This Morning, Kathryn Bracho served as the Mistress of Ceremonies for the evening. The night began with welcoming words and an organizational update from Barbara Behling, Communications Officer. Following Behling was Greg Novinska, Region CEO, with an update on blood services. One-a-Week Club Awards were presented to businesses and clubs who committed to at least 52 donations of blood per year, or one per week during the previous year, followed by dinner. After dinner the Volunteer Recognition Awards were presented to individuals and groups for their exceptional volunteer work. Jack Davies, Ed McHugh Worker of the Year award for front-line volunteers with exceptional reliability to the blood program. 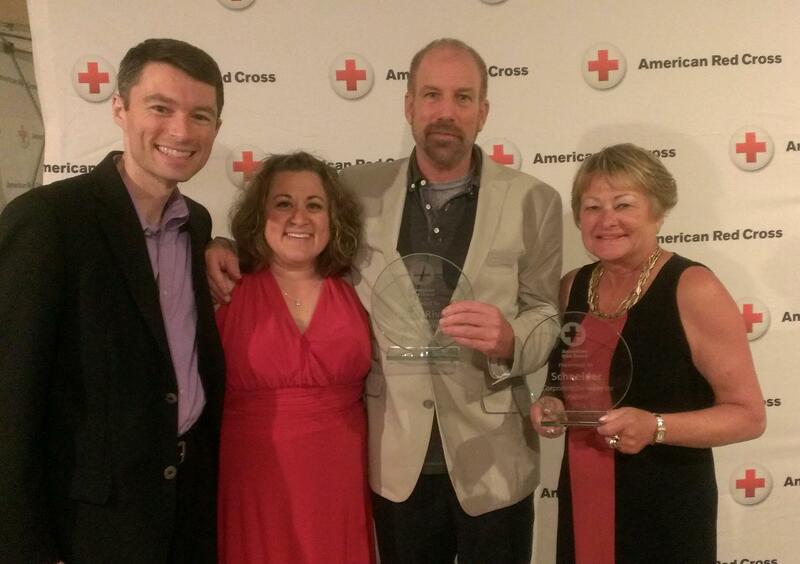 Humana, Business, Group or Organization of the Year, given to a business or group of volunteers for years of commitment to the American Red Cross Blood Services program. Ken Frosch, Hilary Lesperance Award for outstanding support in the Blood Services Program. Bryan Barbeau, Kerrie Forester Emergency Services Award for commitment and dedication to Disaster Services and members of the Disaster Response Team. Bill Craig, Andrew Janssen Transportation Award, for outstanding work in transportation services for the American Red Cross and providing transportation for the elderly population and those with disabilities to help them sustain an independent lifestyle. State Farm, The Outreach Award, for a volunteer or business in Preparedness, Health and Safety, Services to Armed Forces, Community Disaster Education or other areas that involve education and outreach. Festival Foods, the Corporate Benefactor Award, for a business with outstanding commitment and dedication to the American Red Cross. Michael Gallagher, the Mrs. Crane (Mary) Murphy Award, presented to a member of the Board of Directors for exceptional contribution and advancement of the American Red Cross. Dee Hansen, Behind-the-Scenes Award presented to a volunteer who assists with essential office work at one of our office locations in development, facilities, reception and other behind-the-scenes jobs. Bea Wettstein and Sharon Bryfczynski, Rookies of the Year, presented to a volunteer for exceptional level of service and has started within the past year. Mike Petrick, Volunteer of the Year Award, presented to the individual who has demonstrated long-term commitment to multiple programs of the American Red Cross. Eric Witczak, Clara Barton Award, the highest award of the night, presented to an individual who exemplifies the qualities of American Red Cross pioneer Clara Barton.